Ah, Gormball. 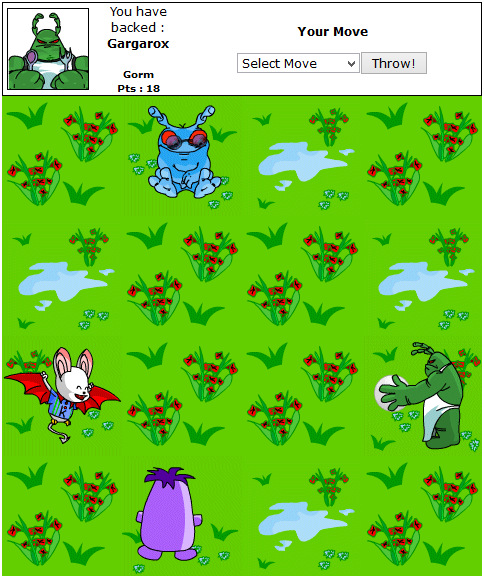 That most timeless of Neopian sports, enjoyed by children and adults alike. Two parts hot potato, one part water balloon fight, and with just a dash of alien invasion, it's sure to be unlike any other game you've played before. When Deckball just won't cut it and Wingoball is a little too creepy, it's gotta be Gormball! Before playing Gormball, you must first select a character to play as. While the character biographies attribute different skill levels to each of them, no character is significantly more likely to win than any other. Because of this, neither the character you choose nor their position relative to the other characters matter, and you can choose whichever one you like best. To play, select an amount of time to hold the Gormball before throwing it to the next character in the circle. While your choices for the amount of time to hold the ball are two to five seconds, your opponents are able to hold the ball for as little as one second. You will gain more points the longer you hold the ball, but it will explode after a random amount of time (typically between four and fifteen seconds), and whoever is holding it at this time is out of the game. Occasionally, you will be granted a Gormball bonus. These are extra points (or a loss of points!) awarded at random throughout the game, with the specific bonuses likely to turn up depending on your current score. For each second you hold the Gormball, you will gain 2 points (4 points for two seconds, 6 points for three seconds, etc). When your score is between 15 and 36, the only bonuses you will receive will cause you to lose points; because of this, it is recommended that you hold the ball a little longer than you might otherwise, to increase your score more quickly. Upon winning a game of Gormball, you will be awarded Neopoints equivalent to your final score multiplied by 4, and a random item as a prize. When the player immediately before you loses, you can spend more time holding the ball. While the smallest amount of time you can select is two seconds, if you reload the page you will pass the ball, having held it for only one second. While it may appear that your turn has been skipped, this is a bug with the text, and you can indeed lose on such a turn. When your score is between 15 and 36, you will only get negative bonuses; try to stay between 10 and 15 until you get a big bonus, and when above 15, try to increase your score as quickly as possible. Like many of the old PHP games, your pet may get bored and refuse to play Gormball for the rest of the day. You wanna prize, huh? I'LL give ya a PRIZE! For winning a game, you will be awarded an item from r30 to r70. Below is a list of categories that prizes may be from, along with the odds of receiving an item from that category. For a list of possible prizes, click on a category's name to view all items within the appropriate rarity in the Item Database.